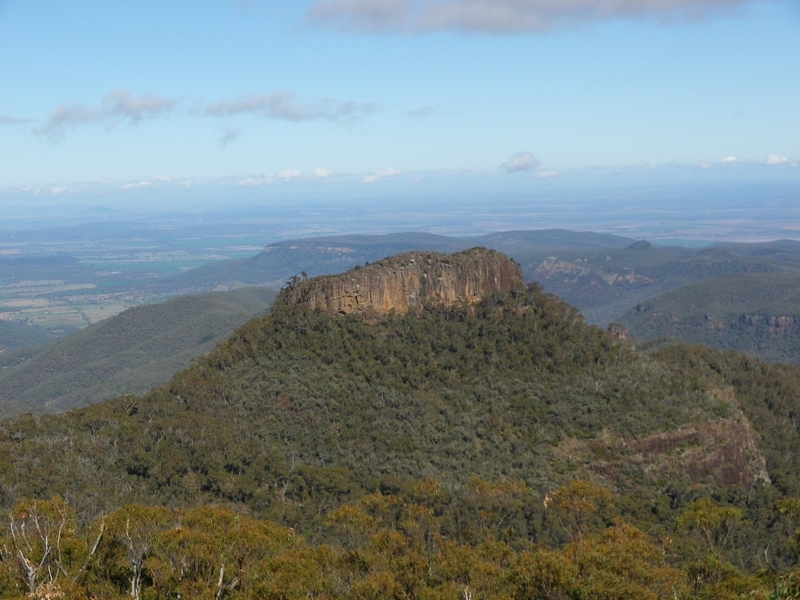 South Black Range is accessed by first driving to Hoskinstown (via either Bungendore or the Captains Flat Rd) and turning east along the Forbes Creek road, which after you cross Forbes Creek (I think) becomes the Mulloon Fire trail. 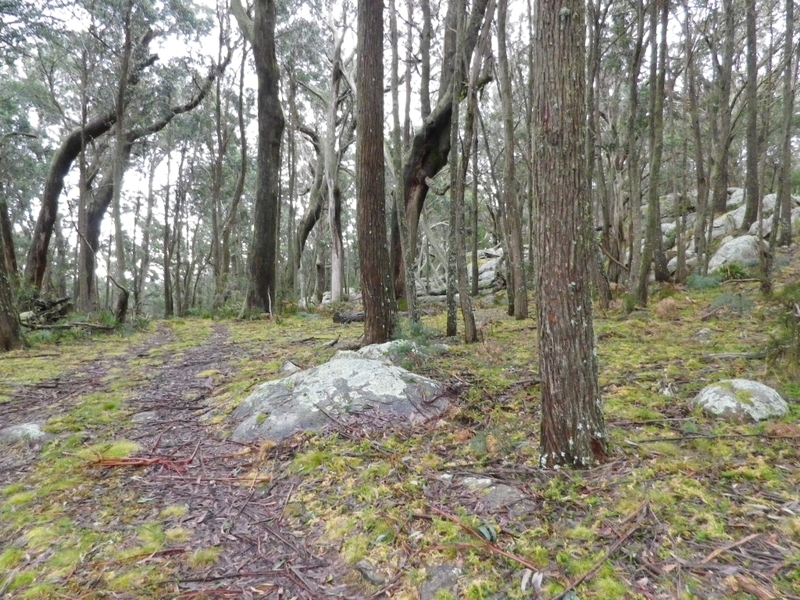 About 10 km east of Hoskinstown, you find the North Black Range fire trail heading left (north) and you proceed somewhat more slowly along that trail for about 2km, until you see an even lower standard track heading left up to the summit. At that point you might easily park and walk. It would be less than 1 km to the summit. I found the Mulloon fire trail in good condition and ok for a 2WD. 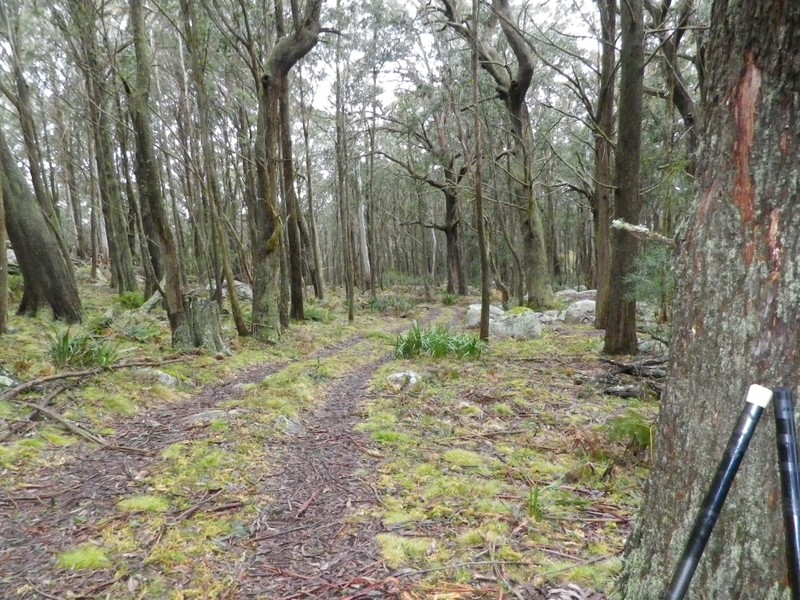 The North Black Range trail was muddy in parts, slippery and the steep bits would be a challenge for a 2WD and the Forester with constant 4WD (but no low range) only made it up some of the steeper slippery bits after backing down and having a bit of a run up. Last time I came along there I was in the FJ Cruiser and I may have used low range but didn’t remember it being this slippery – but that was in September so there’s the answer most likely. Along the trail you see some interesting sights including this remmant of someone’s history. The radio activation, oh yes, that’s what I came for… I took two squid poles with me and used one for the 6m coaxial dipole. This has a coax-based choke at the lower end of the dipole, and another choke a quarter wave below that. The second choke was found to be a very useful addition keeping RF off the outside of the coax. Several 6m and 10m contacts were made back into Canberra and then a session on 40m filled the log. 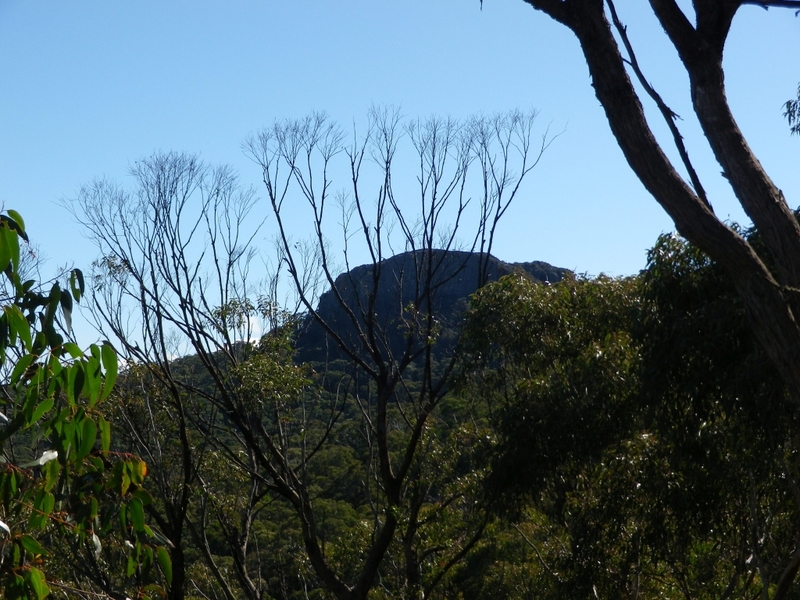 This location is within the Tallaganda NP. The antenna used on hf was the usual linked dipole. The weather on this summit was occasional rain drops and cold wind. When I got back to the car the outside air temp was 4C. I removed a few minor trees from the road along the way. 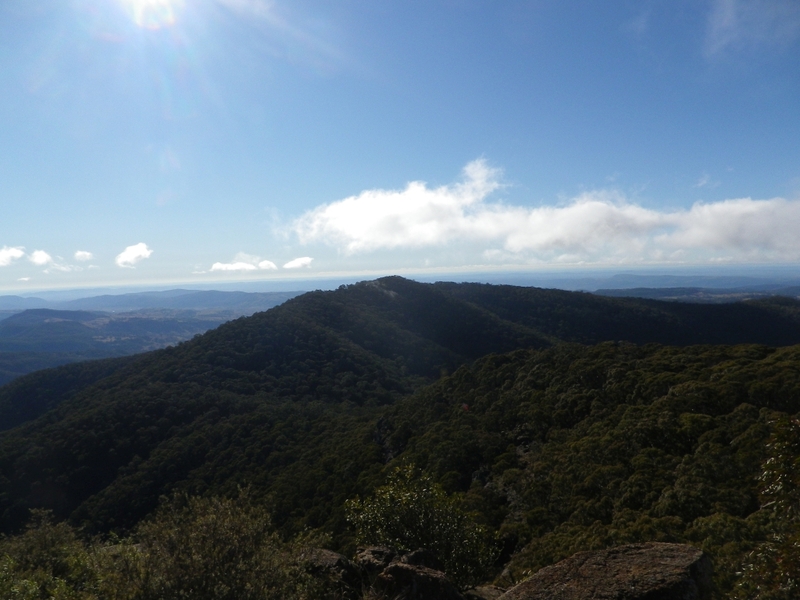 After passing the Palerang trail I continued east to Braidwood. 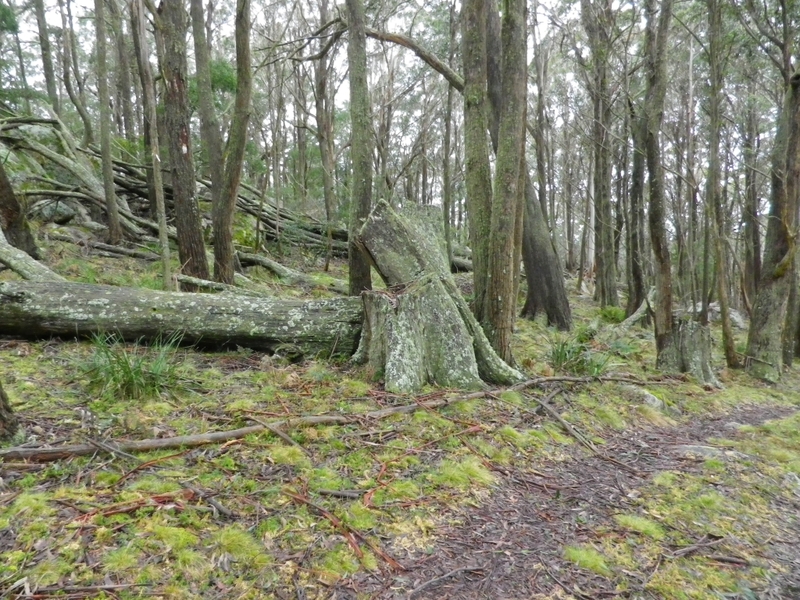 Within a few km of the Palerang trail there was a more substantial tree lying across the road. I had no saw. I looked at ways of snapping off upper branches, found it was too green and I didn’t have any way other than a long period of sawing with my swiss army knife. So then I looked at driving over it where others had. 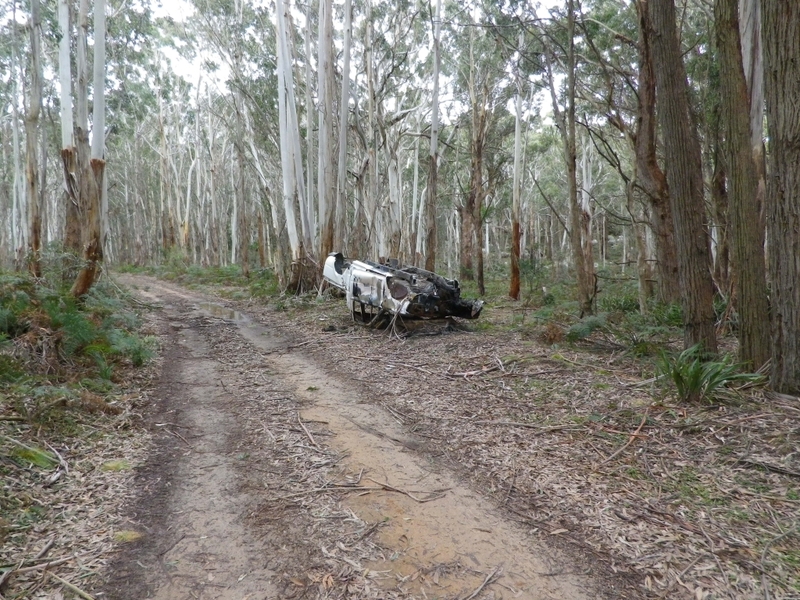 It looked like the Forester had enough clearance so I drove over slowly. Hopefully someone better prepared, with a chainsaw or at least a bush saw like the one at home in my shed, will have cut it up before anyone else goes that way. Note to self: put the saw in the car before setting off next time. 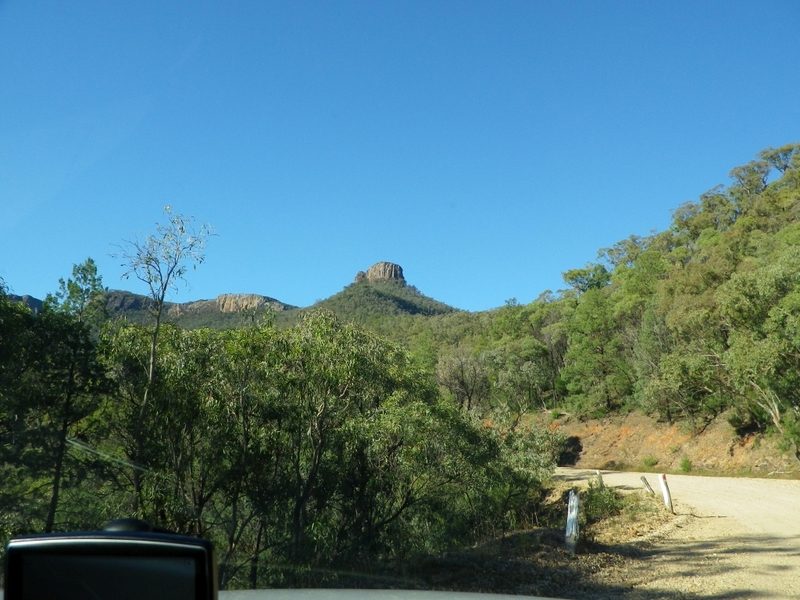 When I got to Braidwood I took a right turn to get closer to Mt Gillamatong on the western side. There is a gate on the road into the paddock so presumably that is the track marked faintly on the GPS leading up to the summit. 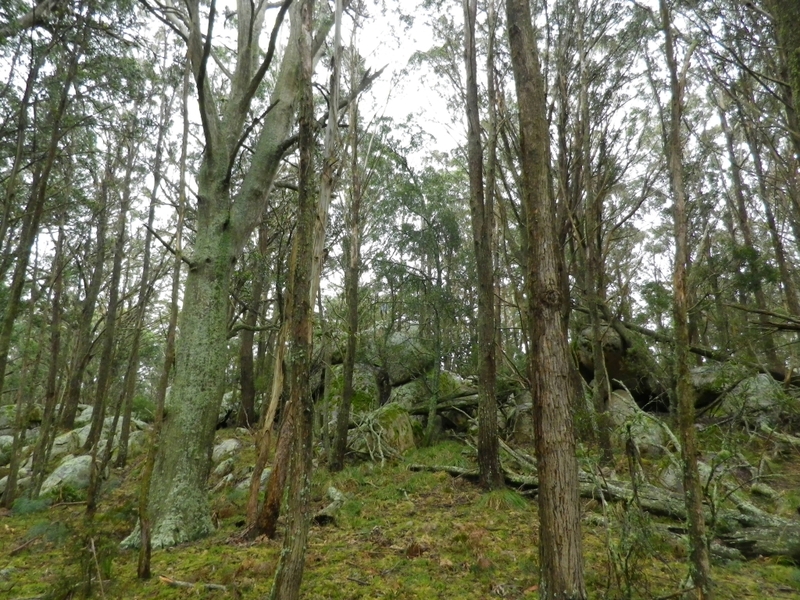 It looked like a longer walk from there – but without the rocks. Might be worth considering another time. The road is called something like saleyard lane. It joins up with Gillamatong lane around the eastern side of the mountain. After leaving the car at the top end of Gillamatong lane, going through the gate with the very makeshift catch, you walk along to the south staying at about the same altitude. Then there is a locked gate into the cow pasture but just before the gate, the track leads around uphill and to the right on the north side of the fence. At the top of that fence there is a small gate. This seemed new and different from last year. A fence along the contour line is then slightly uphill but if you walk back northwards you come to where a tree has fallen on the fence making it easy to step over it. From there it is a zig zag path to the top, with lots of slip risks and I think using two squid poles as walking poles did help on a few occasions. I went a bit closer to the towers this time, I saw one tower and thought I was close enough, then I realised I could also see several dishes and another tower. At that point I sent a text to Andrew VK1NAM telling him I was onsite and setting up. During setup I had several issues with the dipole including pulling the adaptor apart by lifting the pole while standing on the coax. Amazing how a sloping floor puts all your normal instincts at risk. 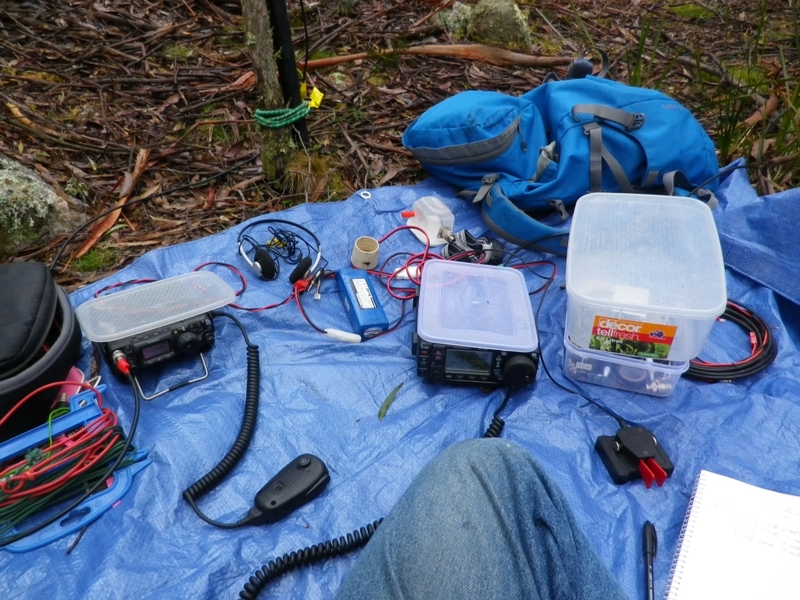 But finally I was on 10m with the IC703 calling VK1ATP who was portable on Black Mt in Canberra. Then Matt VK1MA and Andrew VK1NAM followed. On 40m the propagation had turned to nighttime long skip and conditions were marginal for close-in contacts. 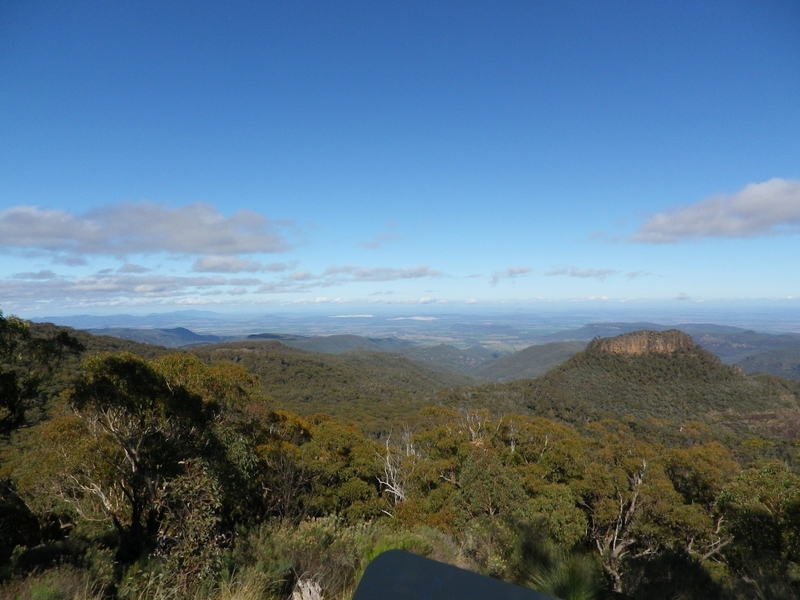 No contact for VK1NAM, a marginal contact on CW with VK2IO (who I worked last time I was on this hill, but he was on a summit in France that time!) and it was a surprise and a pleasure to work Warren ZL2AJ mobile in the north island. Warren will be the Association Manager for SOTA in New Zealand. He commented that the survey process is well under way. Finally I tried to work Andrew VK1NAM on 80m. I could hear him well enough but my signal back to him was too low. I need some extensions to my linked dipole to resonate it on 3.5 mhz. I walked down in the dark, about an hour after sundown, using a headlamp. Again the poles were great and provided necessary stabilisation on the rather steep, slippery and rocky slope. I was retracing my steps with the aid of the GPS and I ended up right on the fence crossing, which was a great relief. The highlight last year was an S2S with Gerard in France. This year I didn’t use 20m at all, as I was too late for the grey line propagation on LP into Europe. And it hasn’t been all that good this winter. Closer to the equinox it will improve a lot. 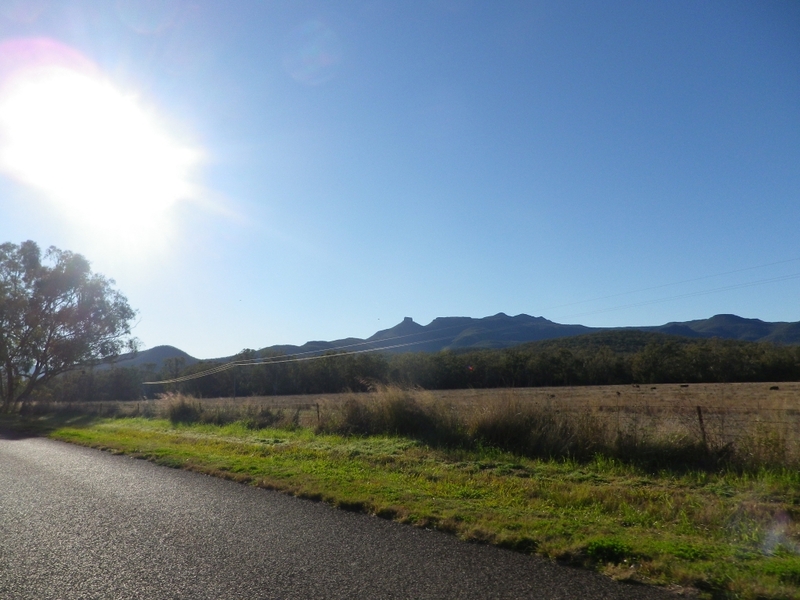 Having stayed overnight at Coonabarabran I drove up to Narrabri then headed east along the Kaputar road. 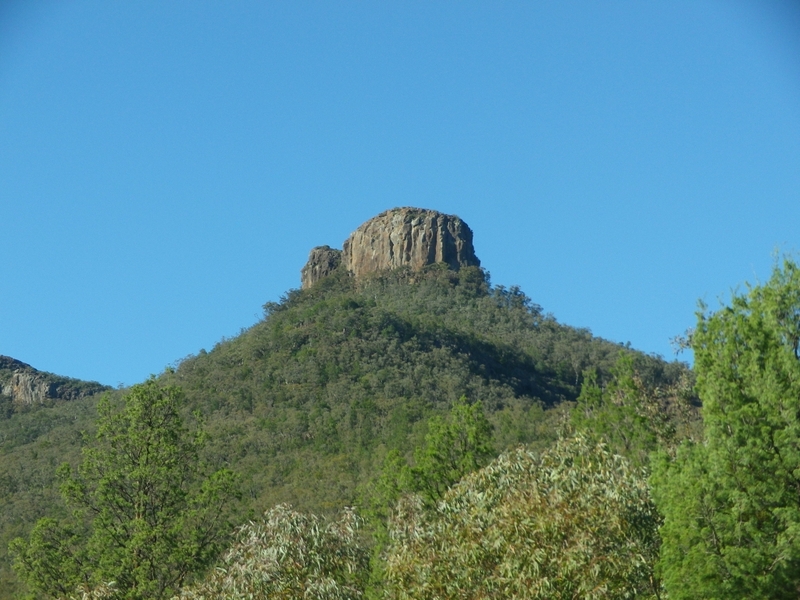 It is about 40 km from Narrabri to the Kaputar summit parking area. 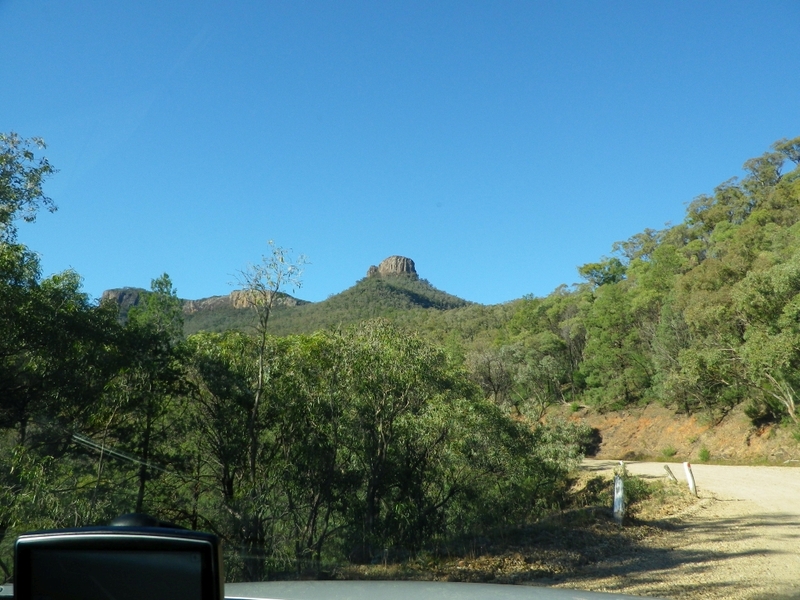 On the way you pass numerous large boulders and impressive mountain ranges, including a section or road where there are rocks on the road, obviously having fallen from the steep slopes immediately above the road. It would be worth avoiding this trip immediately after a heavy rain which is likely to dislodge rocks by erosion. Arriving at the parking area, the first inclination is to rush up the wooden staircase and look at the view. 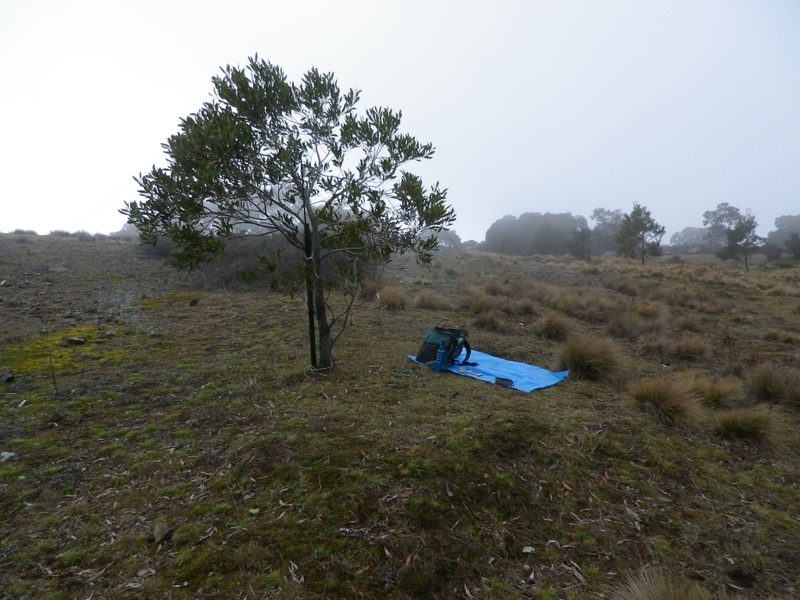 I put my backpack on and climbed at a pace slower than a rush, as there is some distance to climb, possibly more than the 25m of elevation that defines the activation zone. 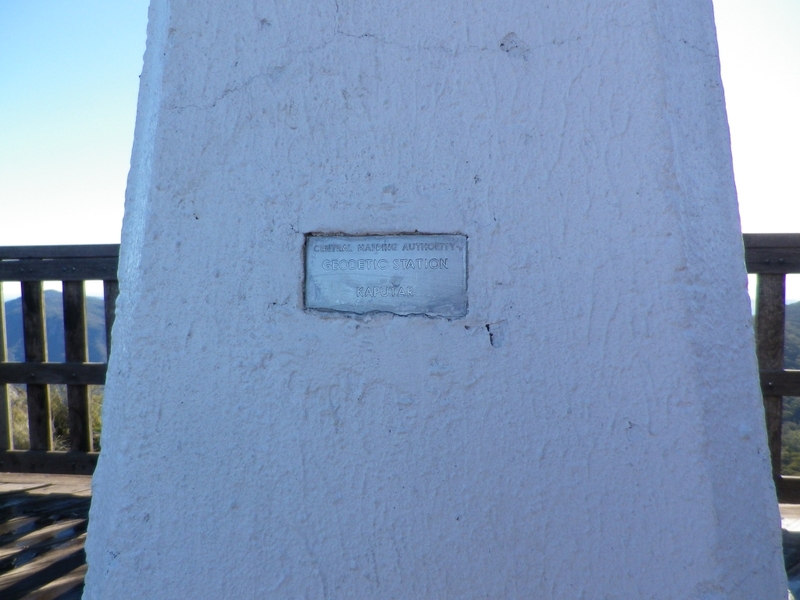 I have a watch with a barometer on it and altitude indicator, but at the time I did not think of using that to measure how far down from the summit I could operate. The view at the top was great. 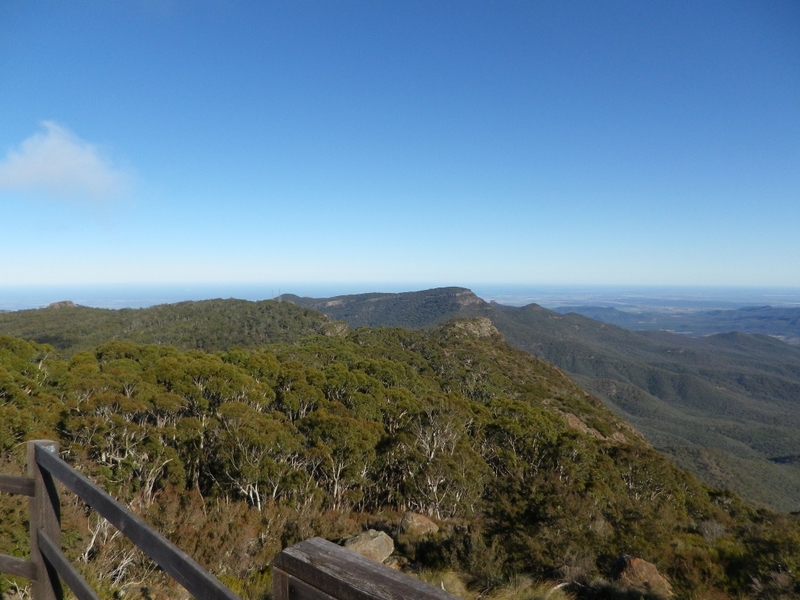 It is the highest summit in the area of course, so has a great view to the north and south. To the west some of the view was blocked by the range I had just driven past. 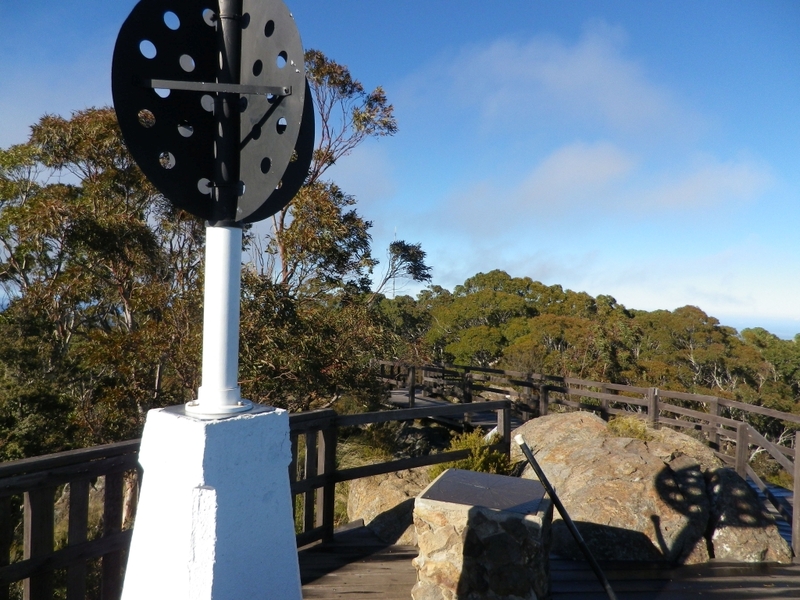 The wind on the viewing platform next to the trig was huge and given the small space available at the top I knew operating up there was not practical. 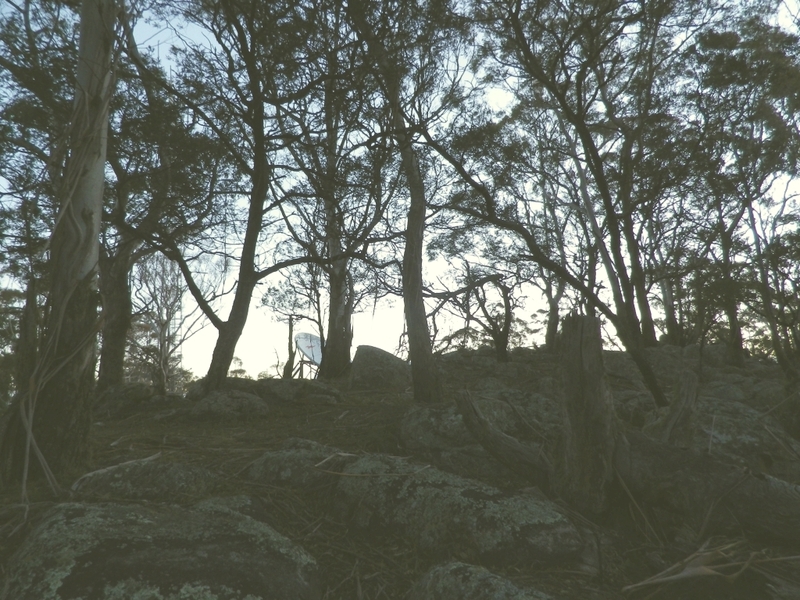 So I set up my gear and the antenna on the steps about half way down from the viewing platform. 40m provided good signals and I got the activation qualified fairly quickly. 10m was the question, what would conditions be like there? From the sound of the band it was going to be difficult. The time was mid morning and I had hoped for some dx propagation but the band was very quiet. On the offchance of a contact I sent an SMS text message to Paul Vk5PAS asking him to listen for me on ssb. No luck, he reported nil heard. Then I called cq for about 15 minutes on CW before striking gold with a contact with Ian VK5IS, who I had worked on 40m and had probably heard me saying I would be going to 10m. Signal was not strong but quite clear, fluctuating quickly as the propagation changed. I suspected sporadic E was providing this contact rather than F layer reflection. Sporadic E is often very selective in that the reflective area is small and the “footprint” of where your refelected signal arrives can be relatively small. This was consistent with Paul not hearing me only a few minutes earlier. Whether that’s right, I cannot know, but it’s always interesting to try to figure out what is happening. With conditions so patchy on 10m I thought there would be little chance of contacts on 6m so did not spend any time trying that band. 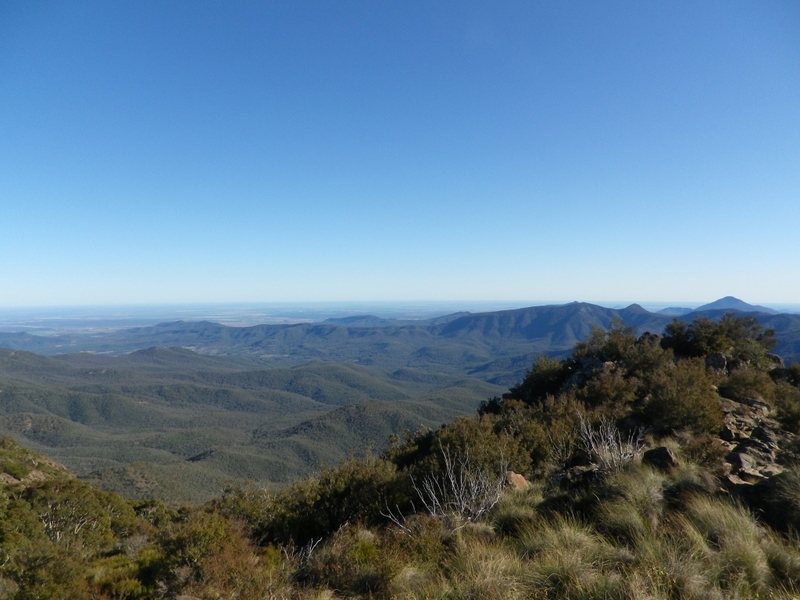 I packed up and returned to Narrabri, having added another summit to my uniques list and qualfiied it on cw and ssb. One more for the 6m/10m challenge tally.